Not sure if your picture is high enough resolution? Email or upload us the photo, the size you desire, and your email addresses, name and number. We’ll have a Photoshop and print wizard(ess) check it out for free. More info is AVAILABLE in our FAQ’s at the bottom of the page. Our everyday price includes shipping within 3 days of your proof approval. Expedited service is available. Please call with your needs. We work miracles daily. Ground UPS shipping is included up to a 6’x30” stand-up, or $15. If you need a special size that costs more to ship, say $21, you simply pay the difference. You don’t have to spend a penny more to get a fun & fantastic cutout, but here’s some additional AVAILABLE EXTRAS. Laminate entire cutout for extra gloss and extra long life: $35. Extra Design time: $1/minute. 15 free minutes included. Call and discuss. Reinforcement details must be discussed. Up to 10’ tall by 5’ wide in one piece. Good Guys Signs employees talented designers. We gladly offer you 15 minutes of free layout and design work. Complex projects will take longer than 15 minutes. We will bill extra time at $1 per minute, and work as quickly as possible. Nothing prints until you have approved the final proof. It is best not to check the proof on a small phone screen. Good Guys Signs prides ourselves on being fast. 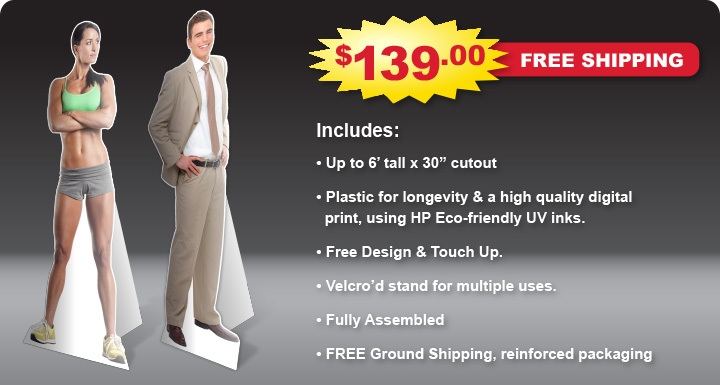 We will print and ship your cutout within 3 business days of your proof approval. Expedited service is available for a small fee. Call for details. We print on durable, lightweight 4mm corrugated plastic. This is a product that can be used indoors or outdoors, and can be washed with light pressure with a mild soapy water solution. Storing Cutouts. Fold your cut out for transportation only. Damage can occur to the folded area with prolonged storage of your cutout in the folded postion. The maximum affordable dimensions (for low shipping prices) are achieved by keeping the total size of your cut out inside a 30” x 8’ area. If you want something enormous, we can print and shape your cutout up to 5’ x 10’ in one continuous piece. Something this large will be like a sail in the wind outdoors. Huge cutouts are not recommended for outdoor use without serious planning. Large indoor cutouts will need extra reinforcement, and can be custom quoted. Call in and we will discuss the use, so we can craft an affordable solution that fits your needs. We print in high definition. The better the quality of picture you send, the more life-like the cutout will be. The picture is ideally 100 dpi at full size. If you are taking the picture on a digital camera, take the photo on the highest setting possible. Pictures taken on modern phones can work too. When you download the photo from your phone, you need to download it at Full size, which is the largest resolution of the photo. We are happy to review your photograph before you order. We can tell if it will look great (or not) printed, or how much time (cost) it would be to get the darker area’s lightened, or make adjustments that you desire. If you want us to take a free look, please send the details and concerns in with the file, along with your email address so we can respond. Do you charge for more than one person in your project? We do not charge more for more people. Shipping charges could go up if the width of your cutout exceeds 30 inches. You have up to 48 inches in width, so the more the merrier. Please note: We offer 15 minutes of free design and set up. If you are sending a complex project that requires more than 15 minutes to cutout, fix art issues, add text, etc, there will be an additional charge for the art time. You can call in with any major credit card, or, alternately, use our secure paypal sponsored web page and pay with any major credit card. http://www.813signs.com/us/payments.html Alternately, you can visit us in Tampa and pay with cash, check or major credit card. You can cancel your order before item is printed. Once printing is complete, cutouts cannot be cancelled. If we have done custom artwork for you, there will be a charge for the artwork. What If My Item Does Not Arrive As Scheduled? We ship all items via FedEx or UPS. Both companies are dependable, but occassionally miss their expected arrival times by a day or even two. Weather issues, National Emergencies, Natural Disasters, and other things can cause delays. These issues are outside our control, and no claims can be made. Should your package arrive late due to shipping carrier error, we will file a claim on your behalf. Any monies returned to us will be sent to you. It is rare that items arrive damaged beyond use, as we pack professionally and carefully. Should this happen, the item will be reprinted and shipped to you. We will require a picture of the damaged box to pursue this remedy. We ship to the United States and Canada. Contact us for rates outside these areas. $15 Standard Ground Shipping Our Free shipping offer is for the continental United States only. It is for packages that can be folded into dimensions 36” x 30”. Larger sizes will cost more. 100% Satisfaction Guarantee: Your Custom Cutout is guaranteed to be 100% free from defects in materials or workmanship upon arrival at your supplied address. The image quality will be a function of the artwork or photo you provide. We guarantee that our print image quality will be the best possible print image from the artwork you provide. should arrive damaged, please contact us immediately and do not discard the original packaging box. Should you be able to e-mail us photos of the damaged cutout, we will ship out a replacement cutout within 24 hours at no cost to you, as long as you have kept the original packaging. Shipping damage claims must be made within two (2) days of arrival of product. We believe this is the best deal in life sized cutouts in the United States. Start with premium HP inks, quality plastic, and Free Professional Design. Add in Free Shipping, and standard turn around times that are literally a week faster than the competition. Your satisfaction is guaranteed. Our Cutouts come with a Velcro stand as a standard feature, so traveling with then setting up your cutout is a breeze. Go with the printer that has made tens of millions of signs. Life sized cutouts, also knows as standees or simply cut outs, really make an event come to life. We truly understand how an event can change when the art is right, the picture is right, and the quality is fantastic. If you are worried about the art, upload it to our website, give us some email contact info, and we will have a professional graphic artist evaluate your photo to determine if the quality is where it needs to be.